What's Poppin' Tonight! 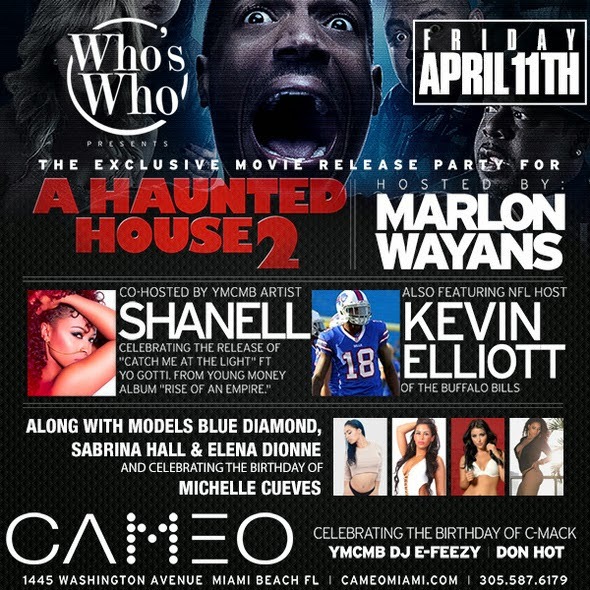 Who's Who Presents Marlon Wayans & Shanell YMCMB + More at Cameo Nightclub ~ Phresh Hott New! Last week was a movie as the crowd enjoyed a performance by MMG Artist Wale at Cameo Nightclub with Who's Who. DJ Clue, YMCMB Mack Maine and more were in the building for Miami's hottest Friday not party #CameoFridays. Join us this Friday a Marlon Wayans hosts the Exclusive Move Release Party For 'A Haunted House 2' Hosted By YMCMB Artist Shanell and NFL Star Kevin Elliott.